Bronson Arroyo, in an apparent show of allegiance to the Red Sox, is extremely close to overriding the advice of his agent, Gregg Clifton, and agreeing to a three-year contract that will pay him between $11.5 million and $12.5 million, according to multiple sources with knowledge of the negotiations. The upside for the 28-year-old righthander is financial security and the chance to remain with the Sox for at least the next three seasons, two tremendous opportunities for a pitcher who just three years ago was placed on waivers. But, that upside -- being signed at a fixed cost for a duration of some length -- also would appear to make Arroyo more vulnerable to being dealt to a team such as Tampa Bay, which is seeking affordable starting pitching and has a player the Sox covet in shortstop/leadoff hitter Julio Lugo. At last check, the Devil Rays were requesting top prospect Andy Marte for Lugo, an offer the Sox have declined. ''While we do not support him in his decision to provide a discount, we hope the Boston Red Sox will not take advantage of Bronson's loyalty and use a potential discounted deal to trade him." Sox co-general manager Jed Hoyer, when reached by phone, declined to comment last night. If Arroyo, who turns 29 next month, had opted instead for a one-year deal, he would still have been under the Sox' contractual control for this season and two more, given his major league service time. By agreeing to this deal -- which is not expected to include any no-trade provisions -- he would forfeit a shot at arbitration this year and after the next two seasons. He would then become a free agent at the end of the three-year agreement. The native Floridian, who began his career with Pittsburgh, led the Sox in quality starts (appearances of at least six innings with three or fewer earned runs allowed) last season with 20. He established personal bests in starts (32), wins (14), innings (205 1/3), and strikeouts (100). 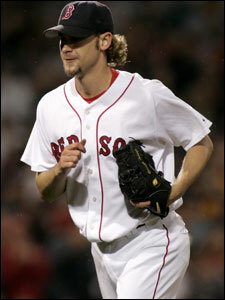 Arroyo, in his two full seasons with the Sox, is 24-19 with a 4.29 ERA in 67 appearances, 61 of them starts. His signing, which is expected to be announced following a physical, gives the Sox some contractual stability when it comes to the starting rotation. Curt Schilling and Matt Clement are signed for two more seasons. Josh Beckett is under the team's contractual control for the next two seasons. Tim Wakefield is signed for this season, with a club option for each ensuing season for as long as the club wishes to keep him, provided he doesn't first elect to retire. Jonathan Papelbon is under the club's contractual control for several years. David Wells, who gives the Sox seven starting pitchers, is signed for this year. The Sox continue to attempt to deal the lefthander, though that appears to be on hold as the club works through deals for Arroyo and Beckett. Beckett is expected to be signed to a one-year deal without proceeding to arbitration. He made $2.4 million last season and is looking to approximately double that to $4.9 million in arbitration. The Sox are offering $3.75 million in arbitration. If a glut of starters were to force Arroyo to the bullpen, he wouldn't have the chance to cash in on the approximately $1 million in incentives included in his impending deal. But, if he were to remain in the rotation for the next three seasons, and pitch as he did last season, he would max out the deal at close to $12.5 million. Meanwhile, the Sox remain in contact with Bob Garber, the agent for Wade Miller. The Sox nontendered Miller for the same reason Houston did a year earlier: fear that he'd cash in at arbitration but not be healthy enough to justify the cost. Still, the Sox, Garber said, remain among a handful of teams interested in the 29-year-old righthander. Garber is seeking a deal similar to what the Sox gave Miller last year: one year, guaranteed, at $1.5 million with the chance to make another $3 million in bonuses tied to innings and days on the active roster. Miller last season made 16 starts and cashed in on only $900,000 in bonus money, going 4-4 with a 4.95 ERA. Garber hopes to have a deal in place with some team by the end of the week. Miller, who had late-September surgery on the labrum that limited him last season and has threatened what was once a marvelous young career, threw a baseball Monday for the first time since surgery. ''The target date to come back game ready is May 1," Garber said. ''He'll miss a month. Then he should be in the form he was with the Astros. It's going to take him some time, but he'll be back. ''Boston is showing some interest still. That's not out of the picture. We'll talk to Jed once we figure out the other offers. They have not shut the door."